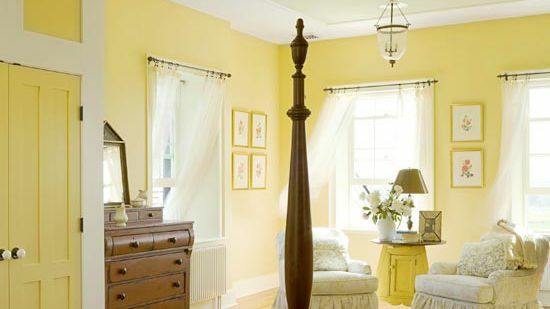 Try a shade of yellow to bring light and zest to your bedroom. Find a hue -- from sunny brights to mellow golds -- that suits your decorating style. 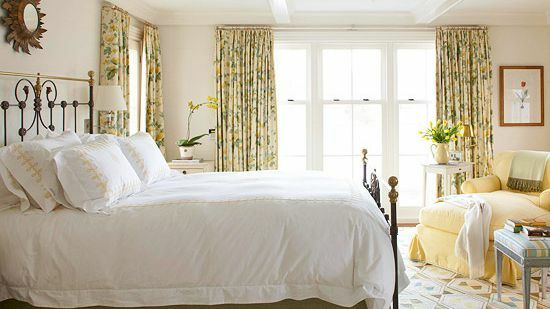 Canary yellow bedding gives this nearly neutral bedroom something to sing about. Beige walls, walnut flooring, and a patterned brown ottoman provide a neutral foundation that keeps the small space from feeling cramped. White on the angled ceiling visually lifts the height of the room while a nubby white rug lightens the dark flooring and adds sink-into softness. 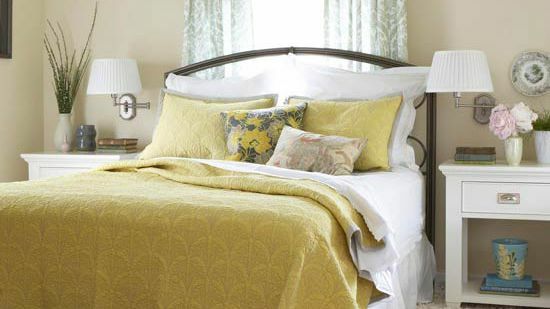 White linens, nightstands, and shades put the spotlight on the yellow quilt and shams. At the window, a cool watery aqua adds a cool contrast. 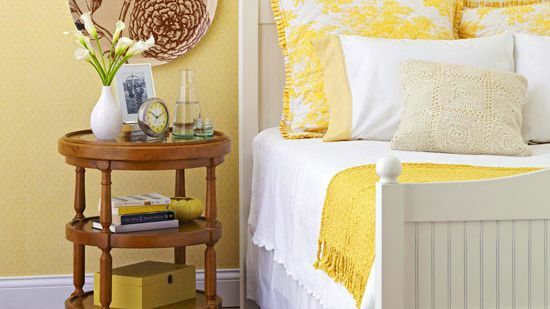 Add a little vibrancy and cheer to your bedroom with yellow. 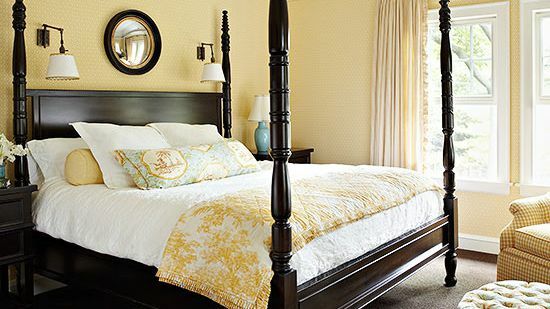 See three different ways to do a perky yellow color scheme in a bedroom. In this traditional-style master bedroom, vanilla walls provide the lightness it needs to keep it from appearing too stuffy and heavy. 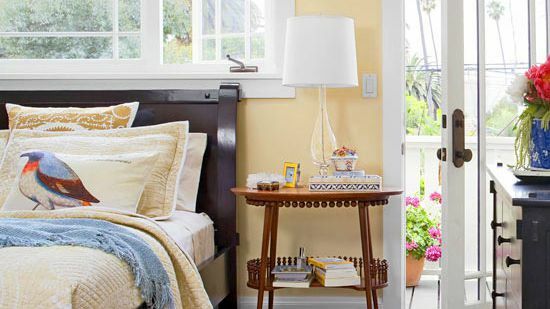 The dark four-post bedstead and nightstands dominate the room, but the bed gets a bit of lighthearted yellow and white toile pattern on the coverlet so it doesn¿t take itself too seriously. Glossy white on the trim and ceiling serves as a foil to the deep charcoal carpet. 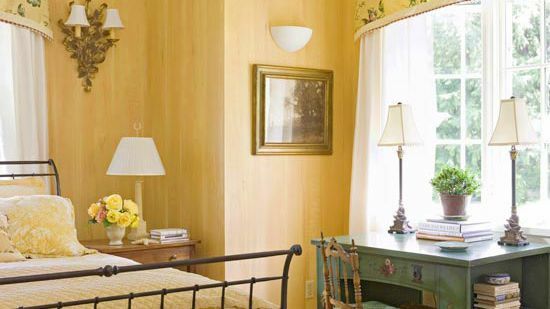 Wearing a patina, this country-style bedroom captures the warmth of citron yellow underfoot and the near-neutral color of golden wheat on the walls. The color palette embraces contrasts in a space where the timeless lines of a hand-carved heirloom bed easily mingle with the modern silhouette of a new table, while the texture of a rustic basket complements that of a pristine ottoman. A mix of styles and cultures brings warmth and personality to this streamlined bedroom. The stage is set with pale yellow walls that complement the sunny aspect of the bank of lightly dressed windows opposite the bed. 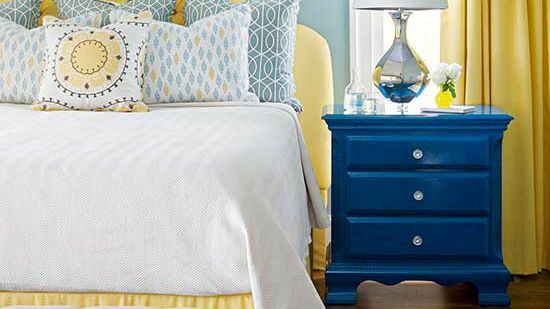 The handcrafted bedstead, too, injects color with bright yellow paint and powder-blue bedding accents. A midcentury reupholstered chair and sleek console bring the sleekness of metal framing. Ethnic collections in dark, rustic wood add both patina and global sensibility. 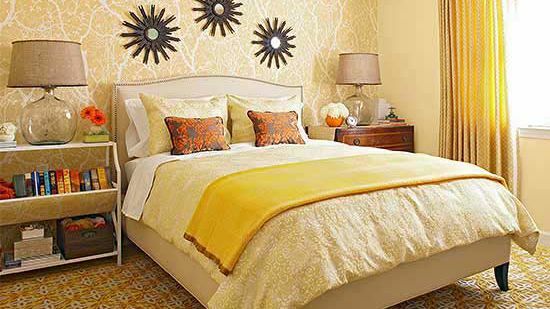 This cookie-cutter bedroom lacked focus, so an accent wall papered in a pretty yellow-and-white pattern gives it the visual interest it needed. The paint is matched to the wallpaper on the accent wall for a cohesive look. Though the room is vibrant, repeating the same color keeps it calm. Shades of yellow, with hints of ivory and beige, unify multiple patterns. 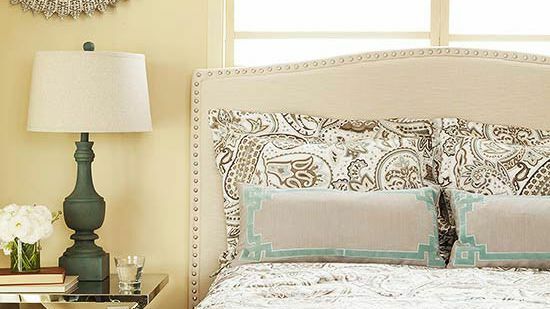 The upholstered bed frame sport solid fabrics as a quiet foundation for patterns. The drapery motif works because it¿s of a smaller scale than the other patterns in the room. 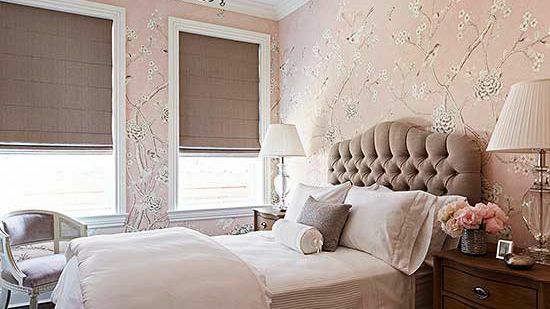 This serene bedroom makes judicious use of color and pattern for a nearly neutral color palette that promotes relaxation. Dashes of buttery tints dot the room but the comfy chaise is the only element that is solidly yellow. 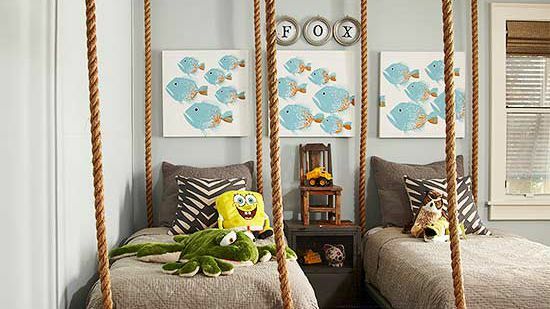 Cool tones of sage green and sky blue complement the color with cool hues. Window treatments, an upholstered bench, and the eye-catching hooked rug capture all the colors of the scheme in equal measure. 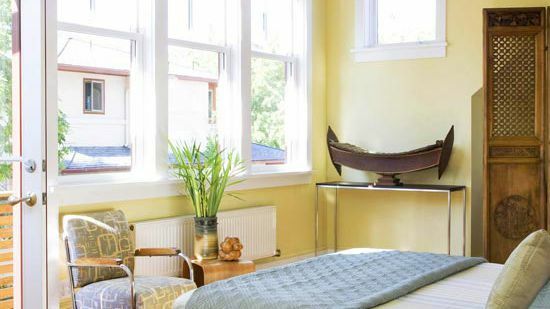 Despite its reputation as an energetic color, yellow can be conducive to quiet relaxation. This pale buttery wall shade has pastel notes that keep it on the serene side of the color equation. Traditionally-inspired slipcovers, bedding, and rug in maize and ivory contribute to the serene atmosphere. 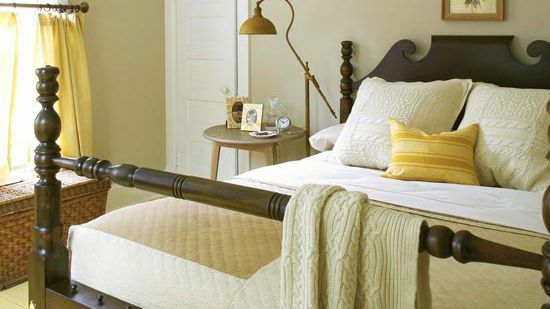 Butterscotch tones add warm brown notes to this charming and traditional bedroom where color and paint create character in a small space. 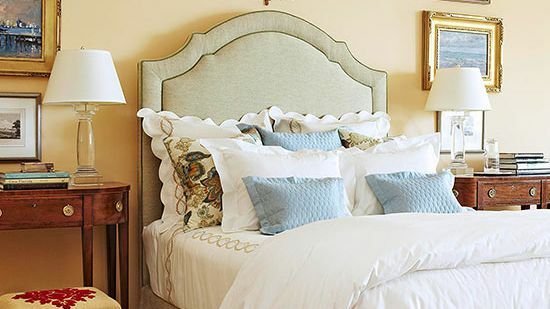 The rich yellow walls are painted to mimic wide wooden boards, while yellow and ivory toile linens, yellow chintz valance, golden sconces, and the bold contrast of an iron bed combine to produce a look that¿s simple yet sophisticated. 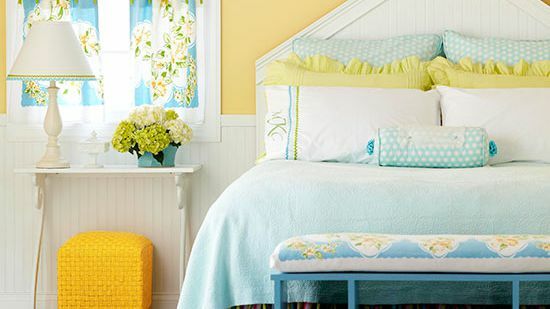 Daisy-yellow walls create a happy background for this welcoming bedroom. 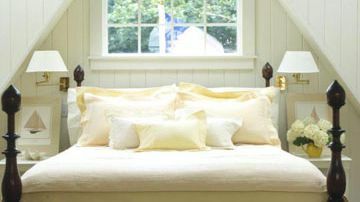 Softened by white woodwork, beaded-board wainscoting and headboard, and a whitewashed pine floor, the yellow makes a sunny statement reiterated by the charming little footstool. To cool down the sunshine color, baby blue, azure, and apple green complete the color palette in the bedding, cafe curtains, bench, and rug. 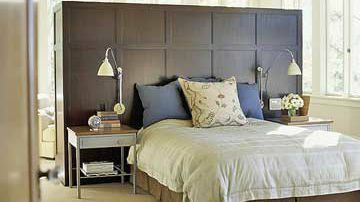 A simple pairing of colors can create maximum drama in a bedroom with minimum effort. 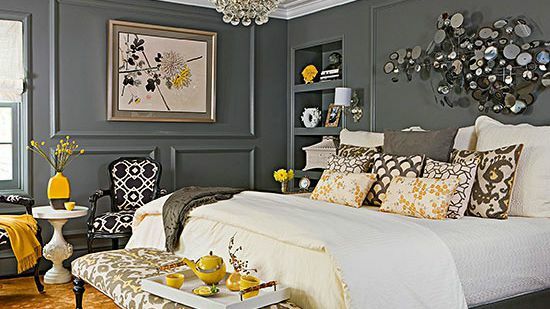 To replicate the high contrast and eye-catching palette of the artwork over the bed, this homeowner employed charcoal-color carpet and an ebony headboard. 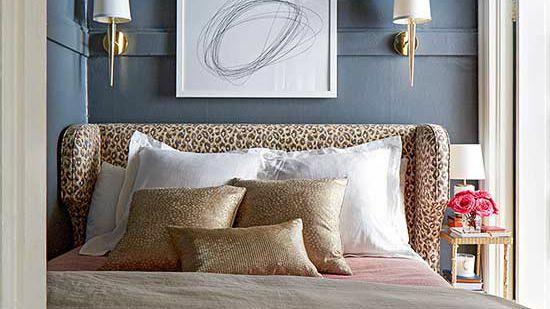 Rich honey paint covers the walls, while shimmering metallic pillows and a patterned bedspread add glamour. 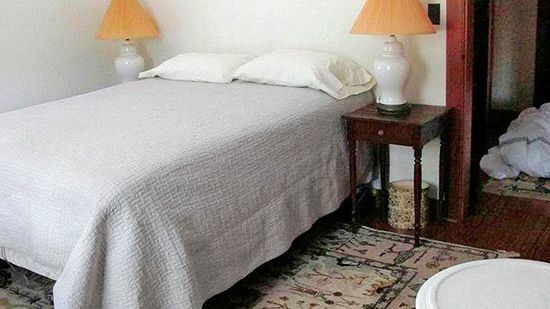 The botanical motif on the bedding also connects to the artwork. What could be more energizing than sunlight on a cloudless morning? 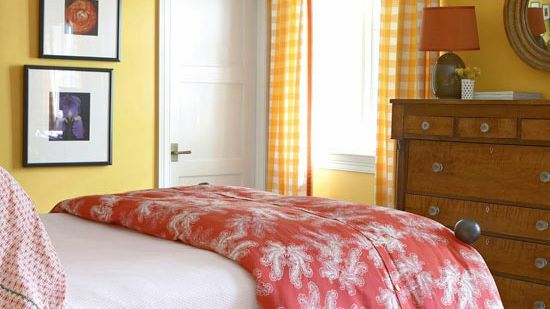 Put that sensibility to work in your bedroom with a sunny color on walls and floor. Saturated hues of rose, aqua, and olive keep the eye moving throughout the room. 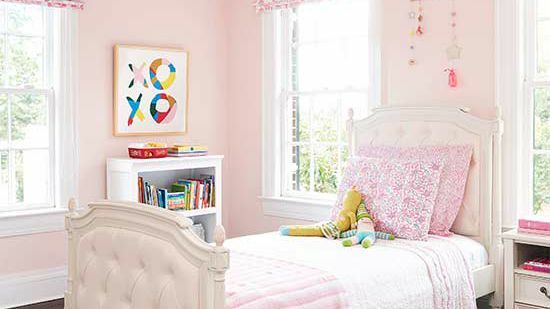 Broad swathes of white on the window wall and bedding keep the vivid color from overpowering the space. This enchanting dormitory-style bedroom features sunny-yellow quilted coverlets and matching bubble-shape lamps that pump up the play factor. 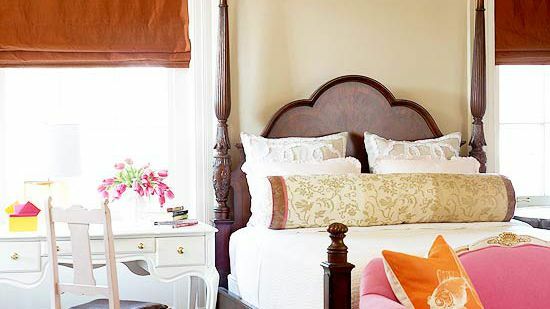 White-painted trim, bedsteads, and linens offer a soft contrast to the creamy walls. 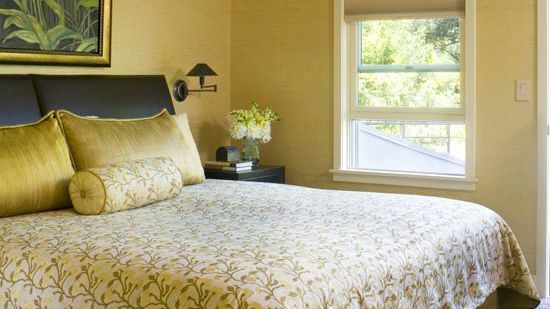 Yellow-and-white checked fabric window shades bring in geometric pattern to coordinate with the toile coverlets. All warm colors have a natural affinity for each other so a color palette of yellow and red makes a cozy combination in this small bedroom. The antique wood bureau brings more warmth to the room and enhances its traditional style. 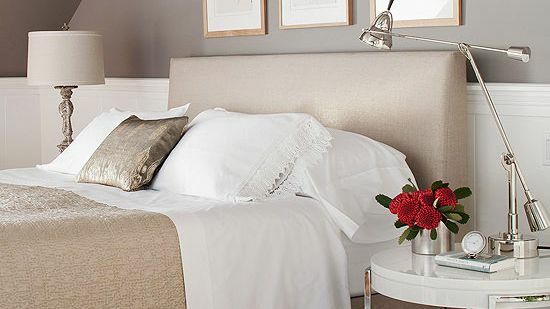 The white ceiling, trim, and bed linens provide neutral visual breaks and keep the palette light. A restful palette, cozy bedding, and the right nightstand make this bedroom a cocoon of color and comfort. The one-color scheme is easy on the eyes and just as easy to pull off. 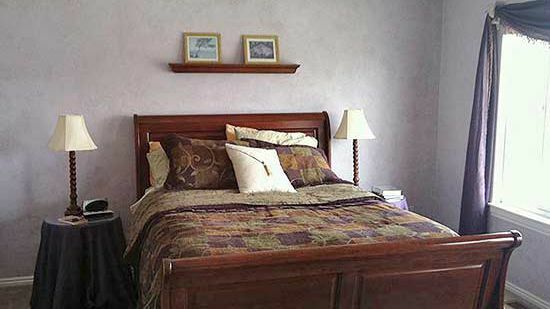 Vary the intensity of the color by keeping walls a couple of shades lighter than the bedding. To keep the palette from veering too far toward a sweet pastel scheme, add plenty of neutrals such as this bordered rug, graphic charger artwork, and the tiered night table. Add texture with a tone-on-tone wallpaper pattern, nubby throw, and crocheted pillow. A Depression-era quilt got the color party started in this lively bedroom. Sunny-yellow figural and striped fabrics dress the bed and windows and tie the sky blue wicker chairs to the other furnishings. A simply striped blue-and-white cotton rug lightens the dark-stained walnut floors. Paneling, window muntins, and ceiling trusses provide a white-on-white series of geometric lines and patterns that add visual depth and interest without intruding on the already active group of fabric patterns. A quilt with flocks of alternating strips brings cheerful yellows, blues, and greens to this attic bedroom and serves as the inspiration for this cottage-style decor. 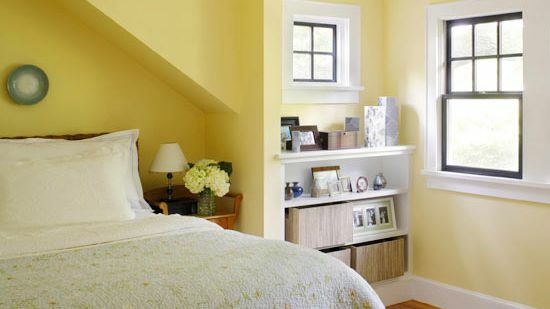 The buttery-yellow hue on the upper walls bathes the space in much needed light, while a coat of crisp white allows the window trim and new wainscoting to pop. Simple green roller shades, a pretty aqua rug, a blue bench, and decorative pillows feature playful fabric that brings additional pattern and color to the room. Big windows and lots of white paint amplify space in this modestly-scaled bedroom. Custard-color walls bring warmth to the room and embrace the group of collected furnishings that are unified by their deep wood tones. 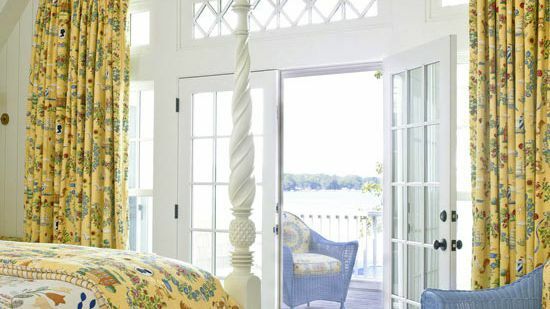 The soft yellow repeats in the quilted coverlet and shams on the bed and on the woven rug, all of which increase interest with visual texture. The quiet palette of this traditionally furnished bedroom transcends period references. The dark shapes of the classic and antique furniture float weightlessly against a background of pale golden walls and a natural woven rug. Subtle hints of color in the upholstered chair, duvet cover, and lamps echo the understated tints found in the focal artwork over the bed. 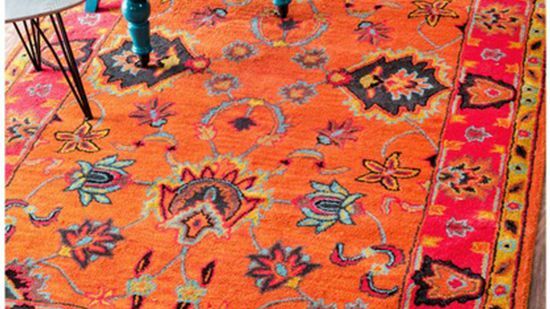 In a part of the country known for dark and dreary winters, using color to lighten spaces is a no-brainer. 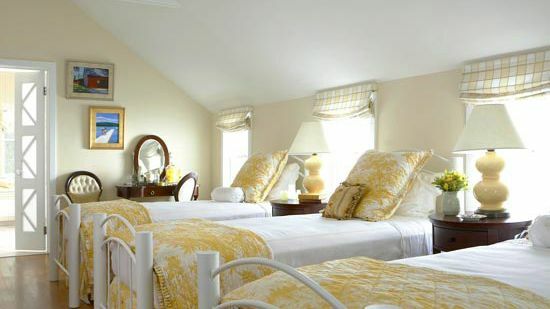 This Vermont farmhouse¿s master bedroom gets its glow on with walls in buttery yellow and trim in off-white. The combination can brighten even the darkest winter day. Angled ceilings can create their own decorating problems, but painting them doesn¿t have to be taxing. In this attic bedroom, the interior walls and ceiling are all cloaked in a warm, buttery yellow that minimizes the strong directionals. On the dormer ceiling, white paint emphasizes the window wall and adds depth to the room. A pale periwinkle coverlet adds a cool note of color to the cozy space.